May 12, 2017 – Hudson Valley Property Group (HVPG), Phoenix Realty Group (PRG), and Belveron Partners are pleased to announce the completion of the $14 million renovation project for Keith Plaza and Kelly Towers, located in the Bronx, New York. 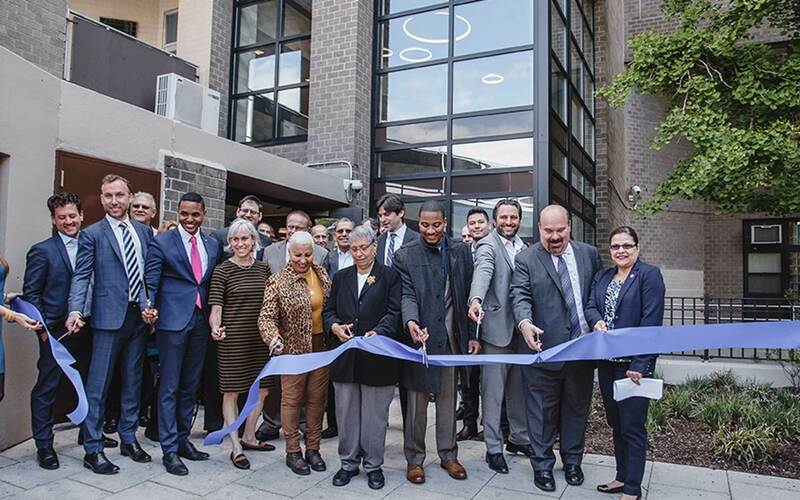 Councilman of the 15th District, Ritchie Torres, HDC Chief Operating Officer & General Counsel, Richard Froehlich, Assistant Commissioner, Division of Housing Supervision, Julie Walpert, and HUD Deputy Regional Administrator of New York and New Jersey, Mirza Orriols, joined the development team at the ribbon cutting ceremony on Friday, May 12, 2017 at 11am. The acquisition, preservation and renovation of Keith Plaza and Kelly Towers provided a unique and innovative financing solution to prevent the loss of 613 units of workforce and affordable housing from New York City’s housing stock. Keith Plaza is one of the early preservation projects in the nation utilizing the Rental Assistance Demonstration II (RAD II) program, which included the issuance of a new 20-year, Section 8 Project-Based Rental Assistance (PBRA) contract. “These important preservation projects will ensure that working class families and retired seniors who reside here have a quality, affordable place to call home for years to come. We plan to follow the City’s lead and continue to work to preserve affordable housing throughout the five boroughs.” Jason Bordainick, Managing Partner, Hudson Valley Property Group. Financing was provided by the City of New York, including the New York City Housing Development Corporation and the New York City Department of Housing Preservation and Development, in addition to an equity investment provided by Belveron Partners and the developers Hudson Valley Property Group and Phoenix Realty Group. More specifically, Keith Plaza and Kelly Towers were financed by approximately $40 million in tax-exempt recycled bonds and an additional $7.7 million secured by 236 Mortgage Decoupling Interest Reduction Payments. Keith Plaza, a 311-unit, 30 story building located at 2475 Southern Boulevard, and Kelly Towers, a 302-unit pair of 17-story buildings located across the street at 2375 and 2405 Southern Boulevard, are 99% occupied and provide homes for both low and moderate income working families and seniors. There is a lengthy waiting list to secure a unit at both of these properties. Both properties are centrally located in a rapidly redeveloping area of the Bronx, near Fordham University, St. Barnabas Hospital, the Bronx Zoo and the New York Botanical Gardens. PRG and HVPG acquired the properties in December of 2015 with the intention of preserving them as affordable workforce housing for the long-term. The buildings were renovated over the over the course of 2016 and 2017. The total development cost surpassed $88 million and the renovation cost exceeded $14 million. Key upgrades consisted of common area and unit renovations to improve resident comfort and safety. The common area renovations included extensive repairs to the parking garage, upgrades to the exterior landscaping and recreation areas, renovation of the lobby and building entrances, new flooring and painting in all common areas, a new trash compactor and a new security system. The unit renovations included new appliances, electrical fixtures, sinks, cabinets, and countertops in the kitchens, as well as new vanities, lavatories and GFI outlets in the bathrooms. Each apartment also received new electrical panels and new door hardware. Significant energy efficiency enhancements were also included in the project scope such as improved heating systems and new lighting.